The Rail Transportation and Engineering Center features the state-of-the art full-scale track loading system. sponsored by the United States Department of Transportation (US DOT) Federal Railroad Administration (FRA) and other public and private sponsors. On Monday, FRA’s leader, the Honorable Administrator Joseph Szabo, will be in Champaign to visit with RailTEC faculty and students conducting this research and touring their newest research facility. RailTEC faculty and researchers teach over 12 courses in rail engineering and transportation. They have also developed a new research lab that is unique in North America for conducting experiments to improve the design and performance of railroad track. The new facility enables researchers to address important questions that would not be feasible using field experimentation alone. Over the past year, RailTEC has consolidated its railroad track engineering research into the 3,500 square foot Research and Innovation Laboratory (RAIL) at the Schnabel Geotechnical Laboratory on the U.S. Army Corps of Engineers Construction Engineering Research Laboratory (CERL) campus in northwest Champaign. On Monday (Aug. 4th), Szabo will get his first look at the facility and its research capabilities. After delivering a plenary address at the Global Level Crossing Safety and Trespass Prevention Symposium (GLXS) being held on the Illinois campus, Szabo will tour RailTEC and visit RAIL which the FRA has helped develop. He will hear first hand from students conducting research and learn about the impact their work is having on US rail safety, reliability and transportation efficiency. As an example of this impact, Edwards notes that the recent 2014 International Crosstie and Fastening System Symposium attracted a group of 150 industry and government leaders to visit RAIL. “There was tremendous enthusiasm, many of them have been in the rail industry for decades but had never seen a laboratory setup like this,” Edwards said. RailTEC’s three principal goals, consistent with the university’s mission are, education, research and service. One important way RailTEC fulfills its service role is by working with railroad track and rolling stock standards committees. The mission of these committees is continual advancement and improvement in railway design practices and RailTEC research results are informing these committees and guiding their decisions. In the mid 20th century, many surmised that highway and air transportation would significantly diminish the need for rail transport and most universities across the United States discontinued their rail engineering programs. 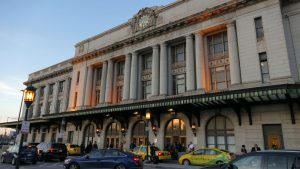 Illinois was the exception, although it reduced the size and scope of its rail program, it retained it with support from the Association of American Railroads and in 1998 Barkan was hired to rebuild and rejuvenate it. “Our students are graduating and moving directly into entry level management positions in the rail industry and having an immediate impact on railroad design and operations,” added Edwards. 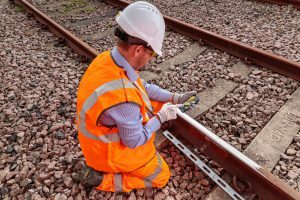 RailTEC infrastructure research is influencing the design of rail, crossties, and the substructure beneath and is addressing ways to make the track safer and more robust to increase its lifespan. In addition to the FRA, RailTEC research is sponsored by the Association of American Railroads (AAR), individual railroads and the railway supply industry. Several of these companies participated in the Tie Symposium and will accompany Administrator Szabo to visit RAIL. RAIL includes several machines capable of conducting tests of railway crossties, as well as a full-scale track loading system. The full-scale system enables study of load transfer from the wheels into the track, ballast, sub-ballast, and subgrade. It includes 22 feet of track and a full 5-foot deep substructure that allows researchers to see how changes in load affect interactions throughout the entire system instead of just one element. Loading occurs using an instrumented railcar axle and wheels to simulate actual wheel-rail contact conditions. The system can measure loads and perform static or pulsing dynamic tests at one location with the possibility of measuring rolling dynamic loads in the future. Amsted RPS’s pulsating load test machine provides the ability to conduct research on component design and performance, and an industry-standard fatigue test described by the American Railway Engineering and Maintenance-of-Way Association (AREMA). 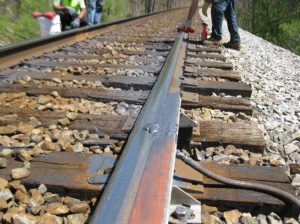 This testing applies 3 to 6 million loading cycles to the fastening system that connects the crosstie to the rail to conduct accelerated simulation of the extremely demanding conditions of actual railroad track. The static tie-testing machine provides three-point bending test capabilities to investigate the flexural performance of crossties. Using this machine, researchers investigate the load capacity of crossties to understand how they accept and transfer load. 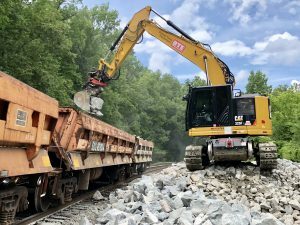 “This equipment allows us to run standard industry tests, but equally important it allows us to conduct research investigating important new concepts in railroad track design.” Dersch said. The development of RAIL has been a collaborative effort of RailTEC, the UIUC CEE Department and several public and private sector sponsors. FRA supported development of the full-scale track loading system. The National University Rail (NURail) Center (led by UIUC and funded by the US DOT Office of Research and Technology) funded the hydraulic system that powers the test machines. Amsted RPS supported purchase of the water recirculation system, helping the operation be more “green” and improve efficiency in the lab. 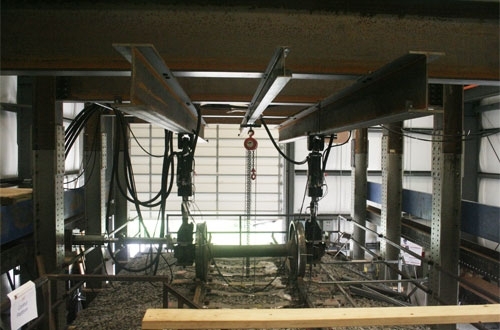 Amsted RPS and LB Foster CXT Concrete Ties provided the fastening systems and crossties, respectively. The CN Railway supplied the rail, ballast and sub-ballast, TTX provided the instrumented wheelset and Amsted Rail helped with acquisition of the steel loading frame. 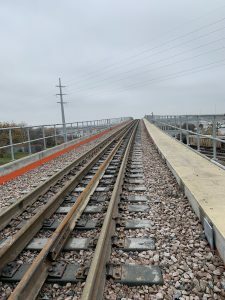 Hanson Professional Services provided engineering review of the overall design and monitored construction to ensure that it conformed with typical Class 1 railroad construction standards. “Not only are we able to answer research questions for the sponsors but our students get the opportunity to improve the design standards going forward,” Edwards said. “One of our graduate research assistants developed a new methodology to analyze how crossties perform when they bend under load and his results are being incorporated into the next generation of AREMA design standards”. RailTEC’s teaching and research activities are helping the University of Illinois fulfill its more than century-long legacy as the leading rail program in North America, supplying important research results and educating students who go on to successful careers in rail engineering and transportation. RailTEC’s contributions and strategic relevance are why Administrator Szabo is eager to tour the facility on Monday. Article originally published by Engineering Communications Office at UIUC College of Engineering, it is used with permission. The author can be emailed at [email protected].